Open-pollinated varieties of fruit and vegetable seeds can be saved for replanting at a later date. Saving and sharing seeds has become popular among organic gardeners. Seed savers care about biodiversity and the preservation of varieties of fruits and vegetables that could, without efforts to preserve them, become extinct. 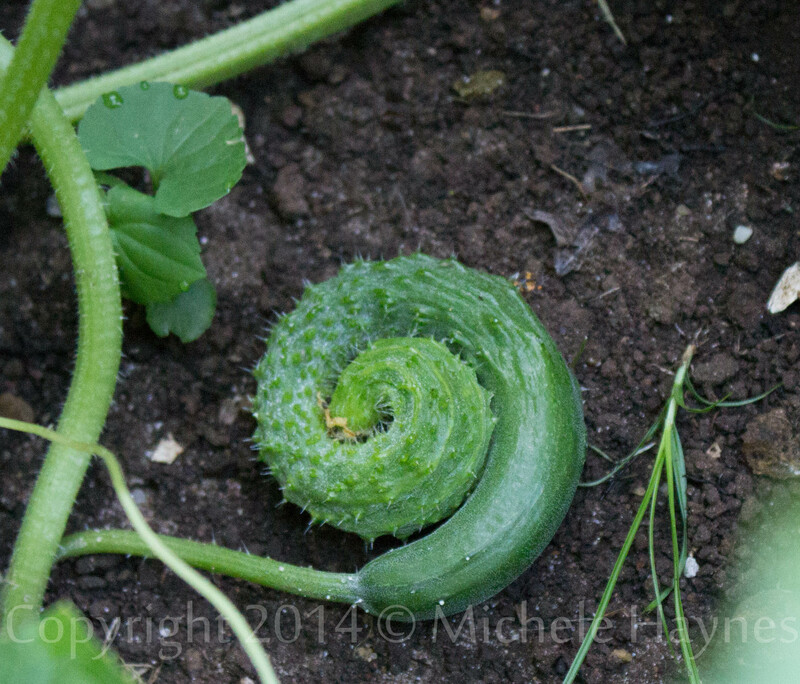 This cucurbit must be left on the vine until it matures. 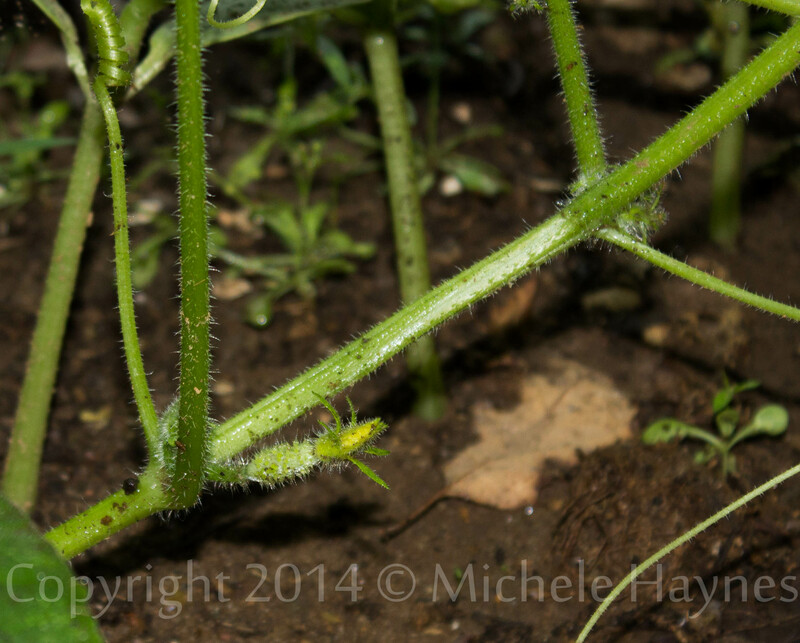 Cucumbers are harvested when they are immature when the intention is to eat them. For seed-saving purposes, the fruit must remain on the vine for a much longer period of time. It is allowed to grow very large and typically turns yellow. 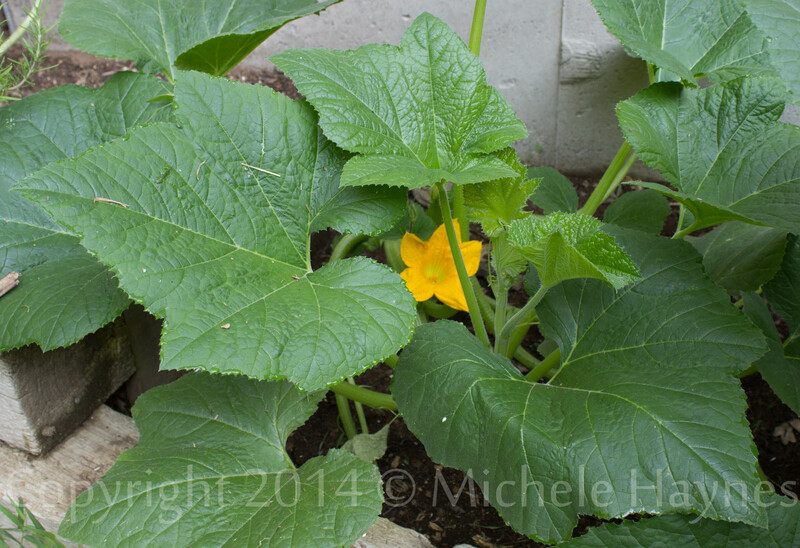 I still have a huge, yellow pickling cucumber that I allowed to mature last summer sitting on my kitchen counter. 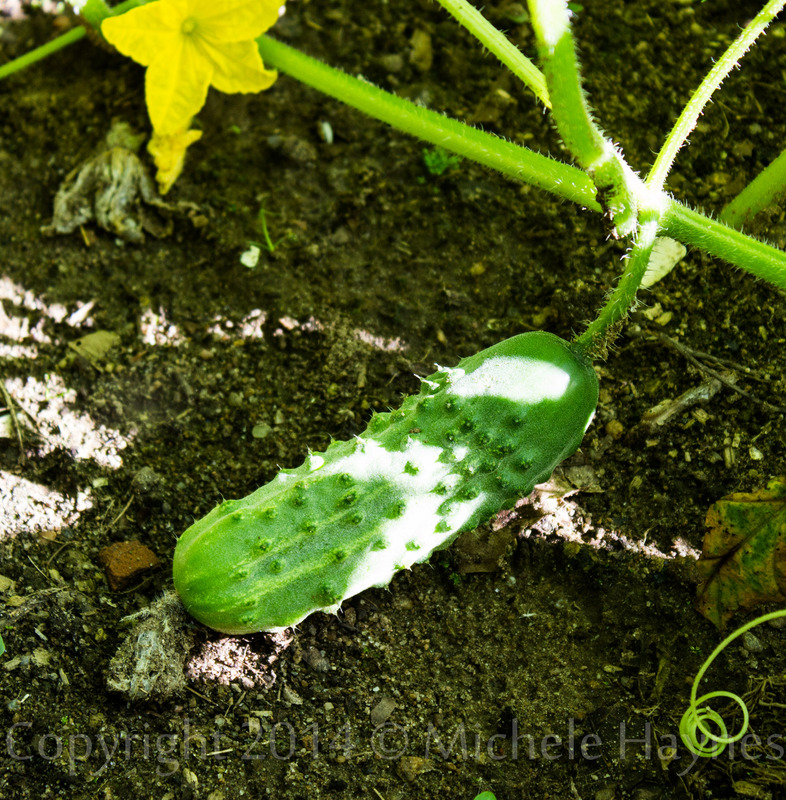 It is filled with mature seeds that I can remove, wash, dry and plant, and I did just that in the spring with another pickling cucumber before planting that variety in June. 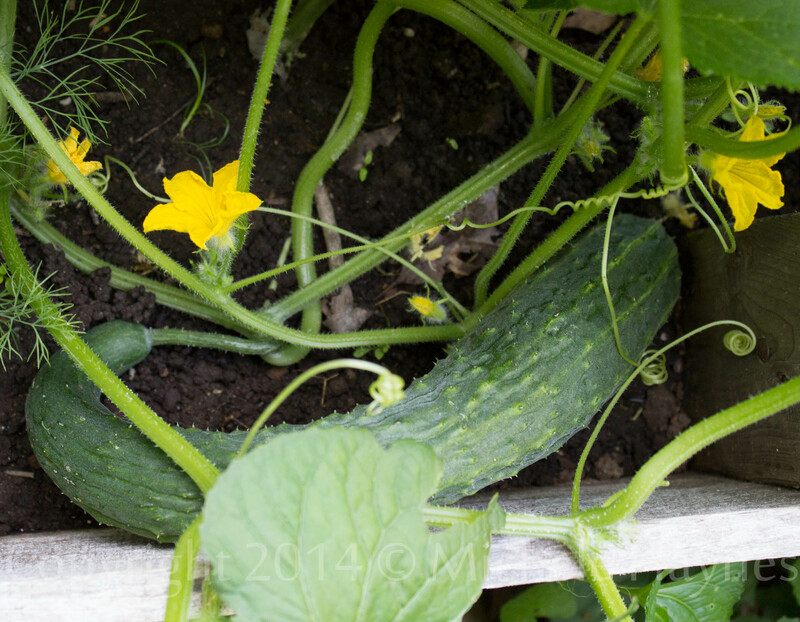 These plants germinated, have grown well, and are producing perfect pickling cucumbers. This year I am saving Suyo Long cucumber seeds as well as the pickling cucumber seeds. They are growing in different areas of my yard, kept apart for purity of the variety. Pollen from a pickling cucumber could potentially be used to pollinate a Suyo Long cucumber which would result in a mutt cucumber. Not what I want. 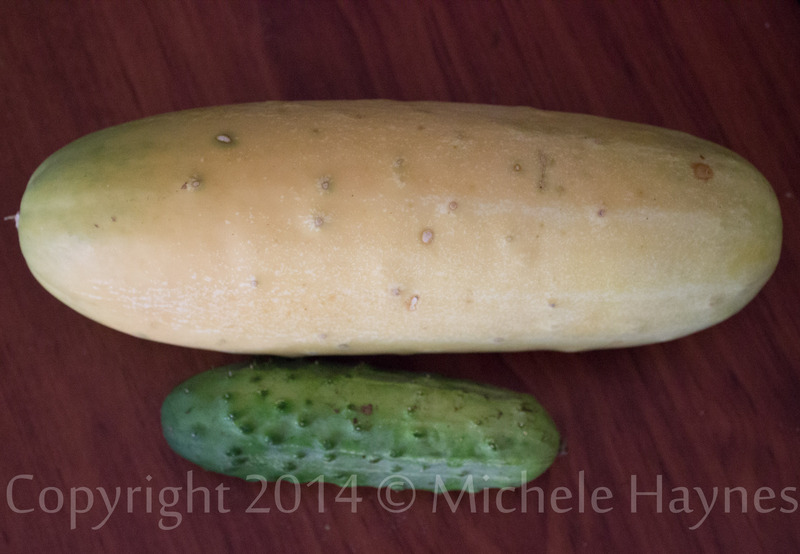 Mature pickling cucumber harvest last fall compared to a 4-inch pickling cucumber harvested for eating and pickle-making. If you have a short growing season as we do in New England, you must allow one or two cucumbers to remain on the vine to mature fairly early in season. You cannot wait until September to choose one or two fruits to allow to mature. 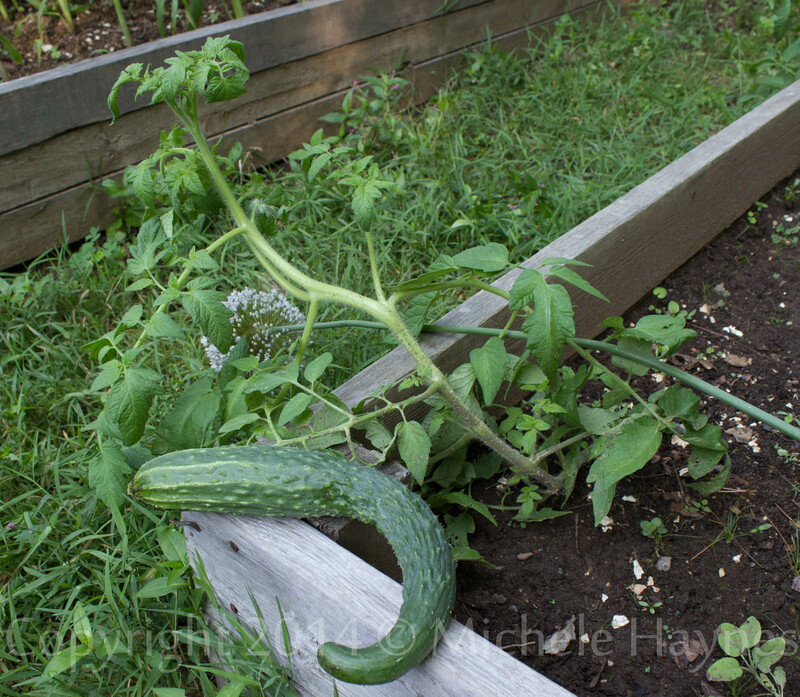 When you allow a cucumber to mature, the plant is signaled that its job of reproducing itself is successful, and that vine will stop producing. 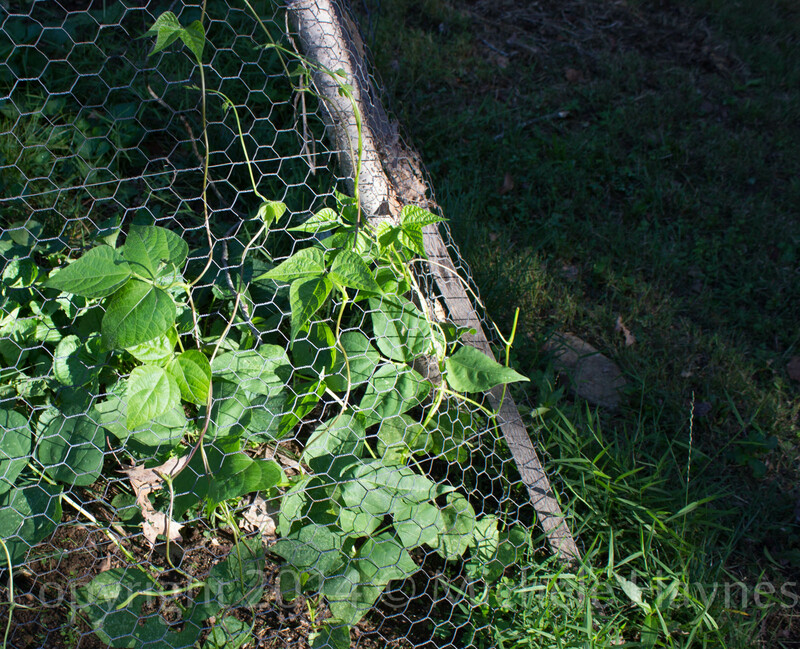 You will most likely sacrifice potential cucumbers when you allow a fruit to mature on the vine. Since you can buy a packet of heirloom Suyo Long cucumber seeds for about $4 or less, this might not be financially wise. You must make the choice. Seed savers sacrifice part of their harvest in order to save seeds or plant extra for that purpose. By saving seeds from cucumber plants that have done well, you are engaging in the practice of adapting seeds to your region, climate and soil. This can be beneficial should you need to grow your own food. I know, that sounds so apocalyptic, but if Monsanto wants to control the world’s food supply, I darn well want to have control over some of the food I eat by adapting seeds to my area, and owning those seeds. I can share those seeds with others, especially community gardens where many people cannot afford to buy $35-50 worth of seeds each spring (and I have done so in the past). Yes, $4 for a packet of cucumber seeds doesn’t sound terribly expensive, but most gardeners grow at least 10 different vegetables in their gardens. That adds up quickly. Leave the fruit on the vine until the vine dies back or right before your first frost. 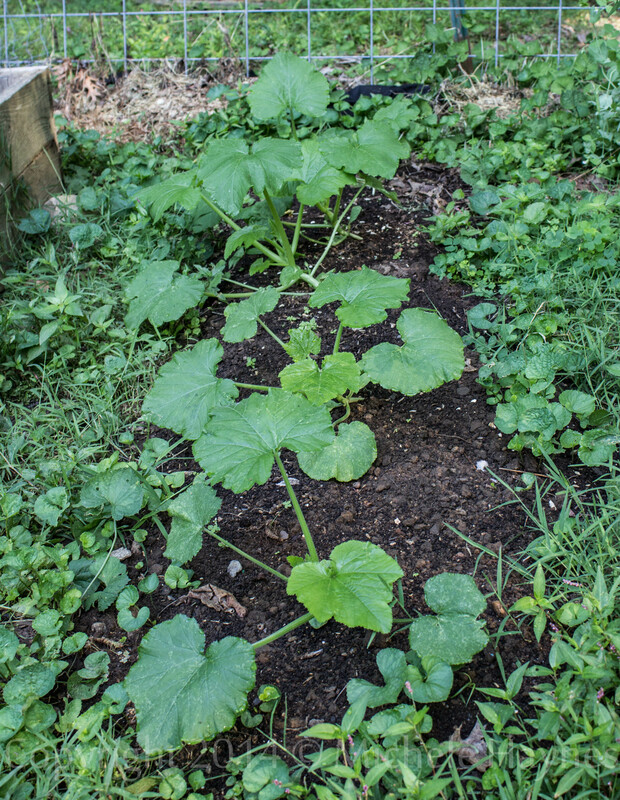 The plant will become unattractive, the cucumber will look like a monster, but you will have a lot of seeds stored up in the ugly fruit that you can use to grow many more cucumbers next year. You can store the seeds in the mature cucumber over the winter and remove them in late winter giving them time to dry before planting, or you can remove the seeds in the fall and store the seeds over the winter. Your choice. Some people use the ferment method to separate seeds from the cucumber pulp but I found that unnecessary. I simply placed the seeds in a bowl of water and rubbed the gel substance off of the hard seeds. I then dried them on a plate on the kitchen counter. Amish deer tongue Romaine-type lettuce flowers. The yellow flowers are a food source for pollinators. The bulbous ones with dried flower petals are maturing the seeds within. When they send out a white fluffy material, they are ready for seed harvest. Saving lettuce seeds is very different from saving cucumber seeds. 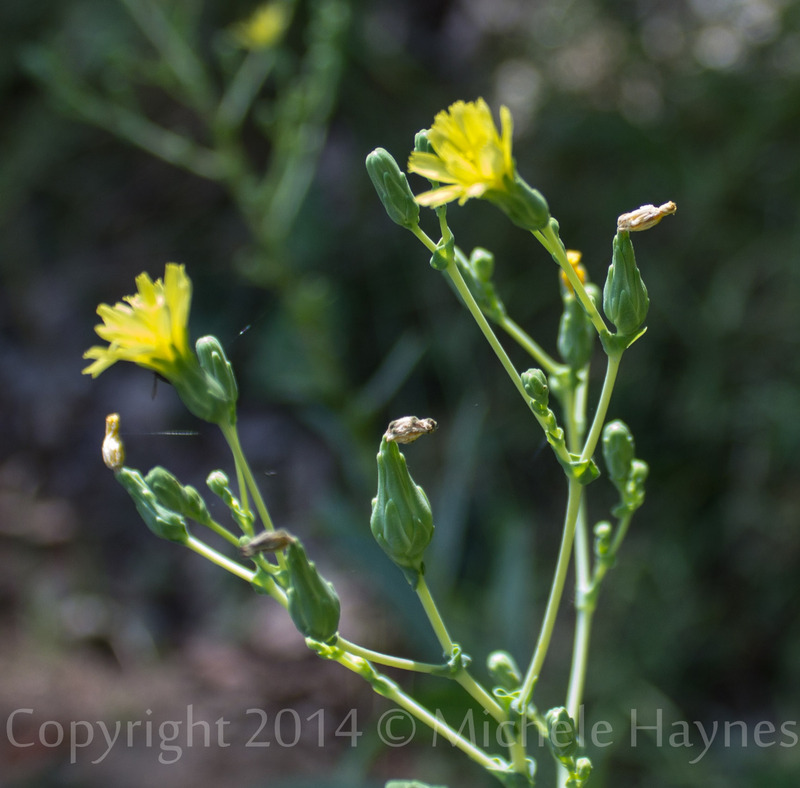 Lettuce bolts when temperatures get hot enough, sending up a central stalk that will eventually produce flowers. Those flowers will produce seeds. Not terribly complicated. The challenging part is knowing when to harvest the flowers. I had to watch a YouTube video the first year that I saved lettuce seeds so that I knew what to look for and how to get the seeds from the plants so that I could save them for use next season. Again, your plants will sprawl and grow heavy under the weight of the pollinated flowers. You need to leave them on the plants until you see white fluff. At that point, cut off the bunches of flowers and their white fluff, place them in a paper bag if you don’t have time to deal with them right away, or check one flower to see if the seeds are mature. Pull the flower apart, rub the seed pods, and you should see tiny, hard slivers in black, brown or white depending on the lettuce variety. I have saved seeds from several varieties of lettuce growing in the same bed with success; they seem to bloom at different times allowing for purity. I found that fact fascinating, and wondered if that is why those lettuce varieties have survived for so long. Simply remove the seeds from a ripe tomato (no green), place in a jar with a little water, cover with a paper towel or cloth and allow to ferment for 1-3 days. Rinse the seeds well, and then place on a plate to dry. 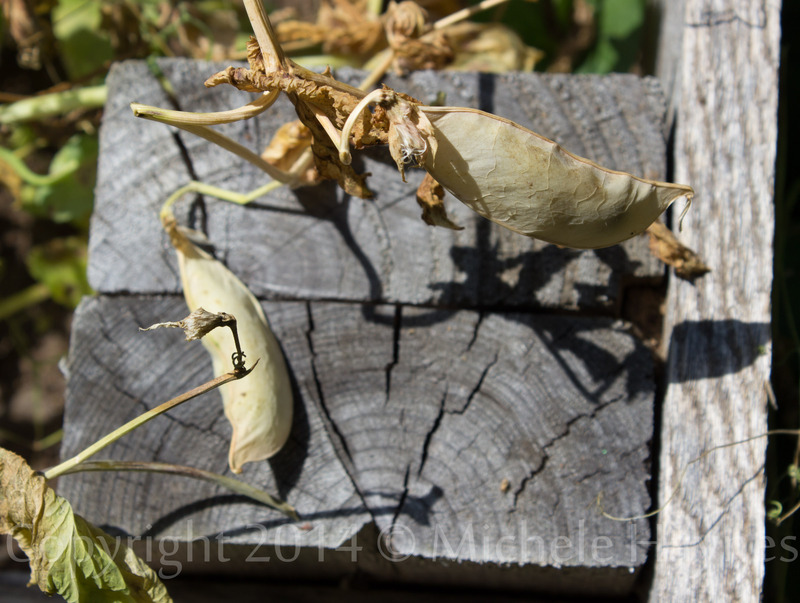 Sugar snap pea pods drying on the vine in the garden. Allow the pods to remain on the plants until the pods turn brown and dry out. 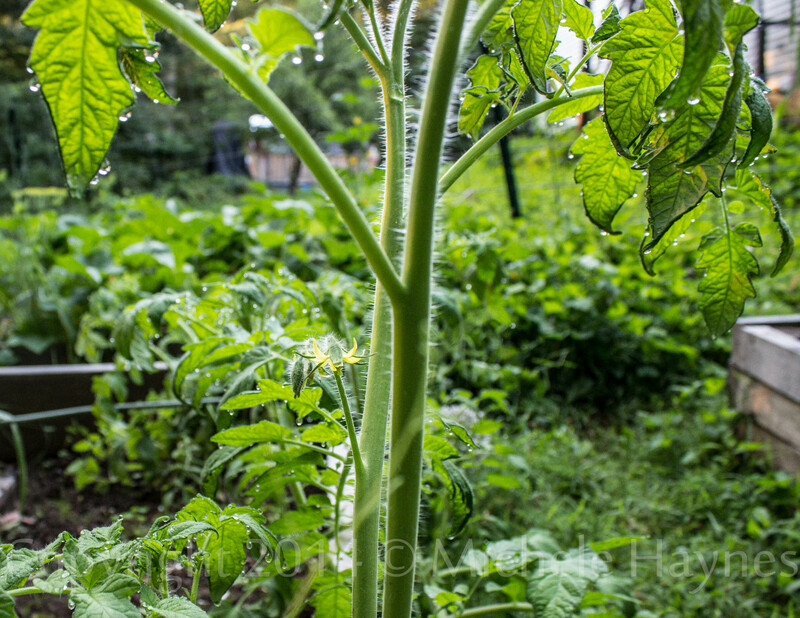 If you have a very wet fall, you might need to shelter the plants or hang them in a dry shed to finish drying out. I throw away any moldy-looking seeds and keep only those that look healthy. Peas can turn a yellow color when they dry out. These are perfectly healthy and germinate just as well as the seeds that stay green. But any black or mold spots are grounds for tossing. Sugar snap peas with tiny black mold spots on them. I will not save these due to the spots and the small pea size. Save the best for seeds. Seed saving takes up space in the garden that you might otherwise use for subsequent plantings and can look very messy. Making provision for these issues is important to seed saving. My garden starts to look very messy around this time as plants overflow into walkways, vines turn brown, and it looks like I am not caring for my garden. Surrendering a bit of the aesthetic is a part of allowing the plant cycle to run its course in my garden each summer and fall. I embrace this time knowing that I am doing my part to preserve biodiversity, will have seeds for next year’s garden and to share with others, and that pollinators have plenty of food at a time when many crops are finished and gardens are cleaned out. It is a trade-off well worth any inconveniences and lack of order. Will you try seed saving? Seed saving all hype and hysteria? It sounds like hype, but it isn’t. Those yelling that the sky is falling (when it comes to seeds) are not being hysterical. We are facing a biodiversity crisis. After reading Michael Specter’s New Yorker piece so obviously pro-GMO and pro-Biotech, the piece that misrepresented, misled and missed the point entirely about Dr. Vandana Shiva’s mission, I was pleased to find a detailed response by Dr. Shiva herself about her education, travels, and the facts behind her stories. She has had boots on the ground in this fight against Biotech food supply takeover for a long time. She is Indian and has personally been involved in fighting the seed monopoly perpetrated by Monsanto et al in her country. She has seen the push by Biotech companies to gain seed monopolies in Africa, Central America and South America. 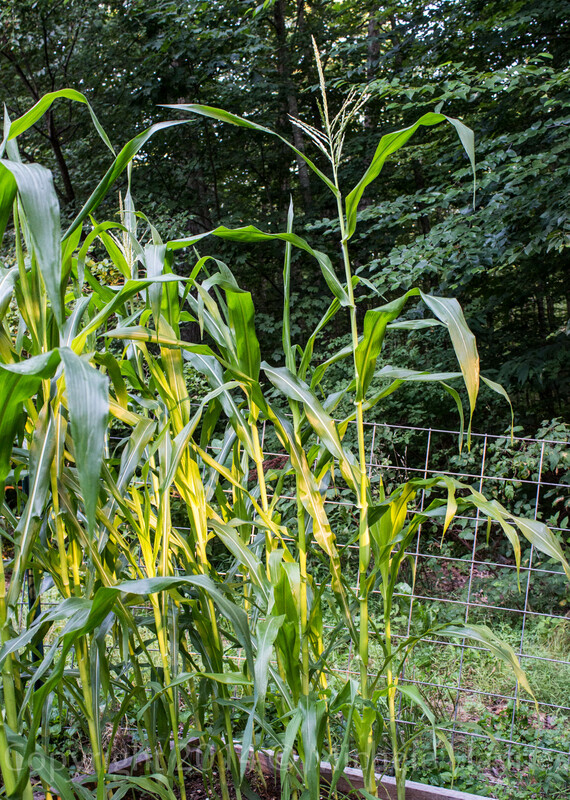 The countries that reject GMOs face expensive, drawn-out lawsuits filed by Biotech companies. Yes, Monsanto sues entire nations. Monsanto et al are patenting nonGMO seeds in the U.S. and Europe. They are gaining control of the seeds that grow our food which in turn positions them to control the food supply. This is dangerous and foolish. Google “USAID” and follow the money trail back to Biotech. The U.S. government is complicit in the spread of GMOs around the world, acting as Biotech ambassadors every step of the way. 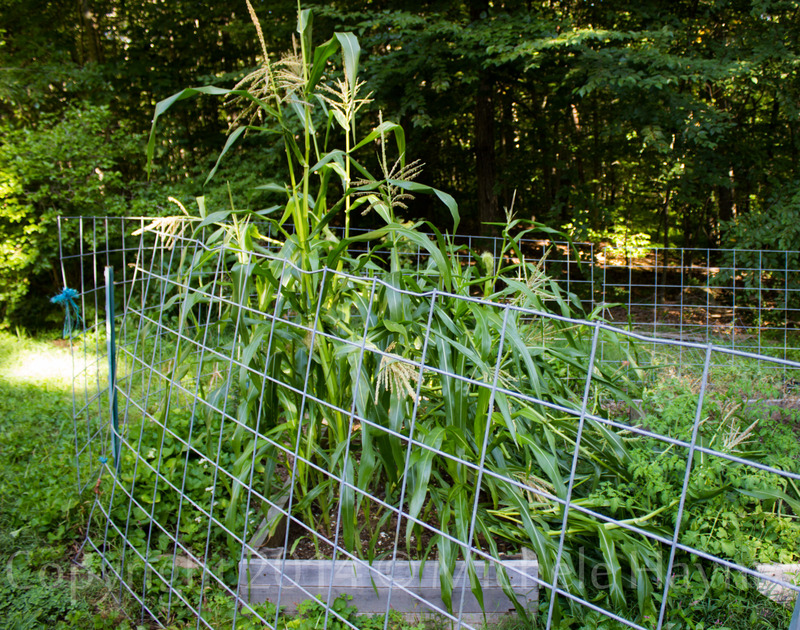 Here is a good site that addresses the issues with seeds: Seed Freedom. And so we sit here looking at a tiny seed, or a big seed, depending on what variety of crop you want to grow. All of this ruckus is about a seed. And yet, this seed represents life to humans. This seed represents the potential to feed the world. Who should be in control of this seed? Farmers? The U.S. government? Monsanto? Dupont? Syngenta? Dow? Food supply. Who do we want to control it? Think about this a bit. Two heirloom varieties: sugar pumpkin and strawberry popcorn grown and preserved. This leads me to my tiny plots of soil where I grow humble groups of a handful of plants each growing season. Some of the crops I simply harvest, pull up the plants when they are done, and am finished for the season. So simple, so clean. Other crops I allow to sprawl all over my garden spaces. These plants fall over, spill out, and send up flower buds that if left alone eventually turn into seed that can in turn be planted next year, or saved for the future. Only certain kinds of seeds will produce that same kind of plant next growing season: open pollinated. Many of these open-pollinated seeds are heirlooms. 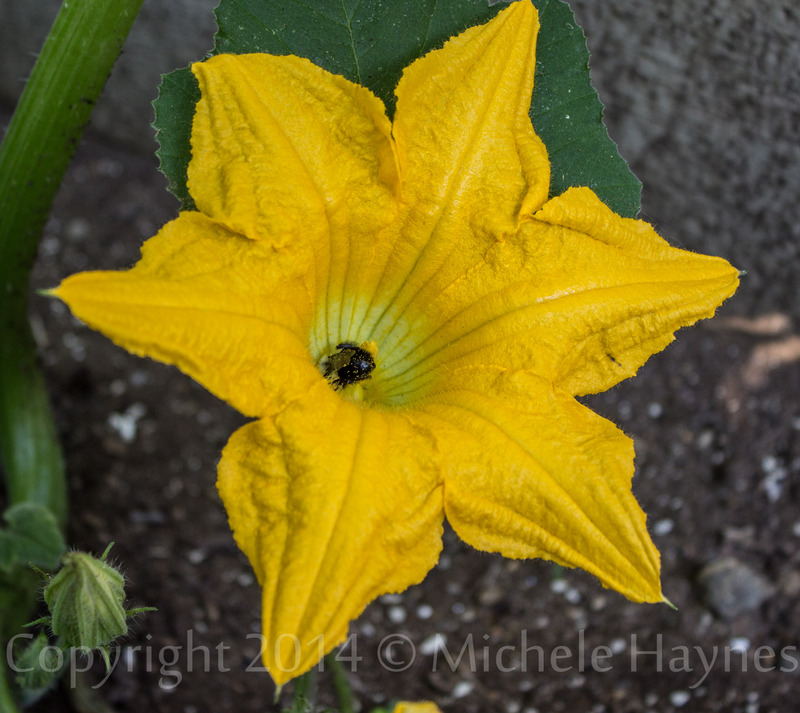 All heirlooms are open-pollinated. There is absolutely nothing wrong with buying and planting hybrid seeds. They don’t harm the environment. But you can’t save hybrid seeds and have a true crop next season if you plant those seeds. Hybrids are not genetically modified. A hybrid vegetable seed might be patented and owned by a Biotech company that then receives a portion of the purchase price should you buy that seed. 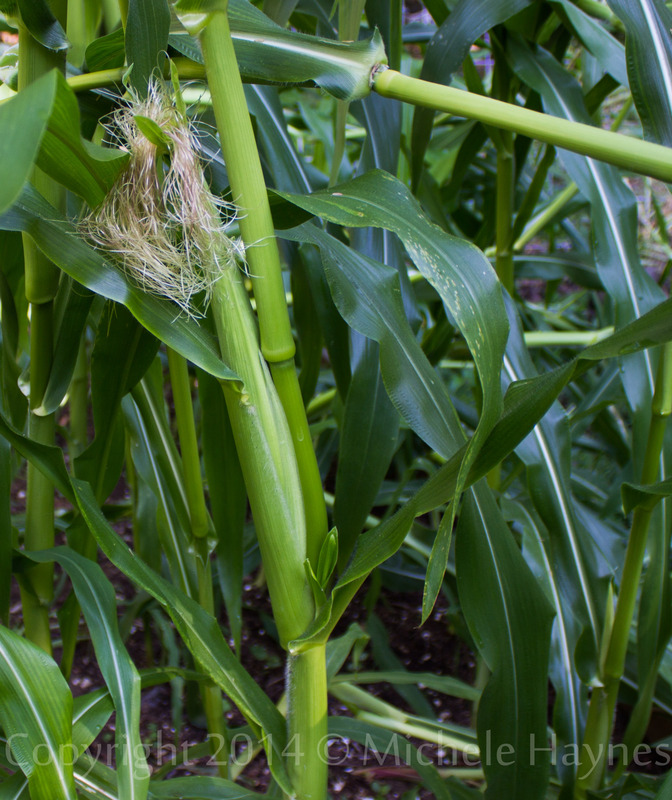 Mother Earth News has a great article on the difference between Hybrids and GMOs. Open-pollinated varieties of seeds are what people are referring to when they talk about seed saving. In my garden at this time, I have broccoli, spinach, lettuce, squash, cucumber, snow pea, green bean and corn plants that are earmarked for seed saving. This requires a different kind of gardening. 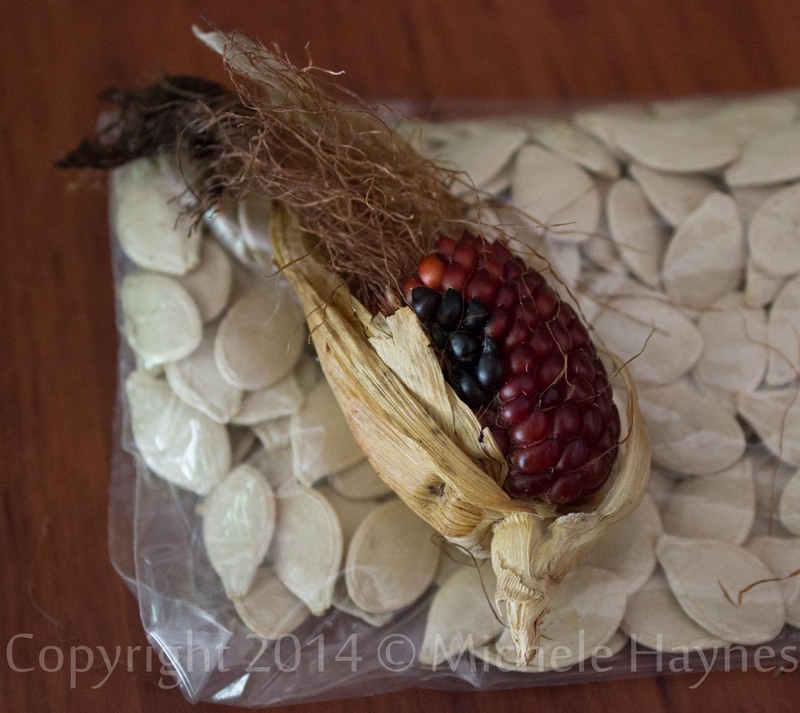 My next post will explain a bit about seed saving and what it entails. It does require a change in attitude and surrender of some control over the aesthetics of the garden space. 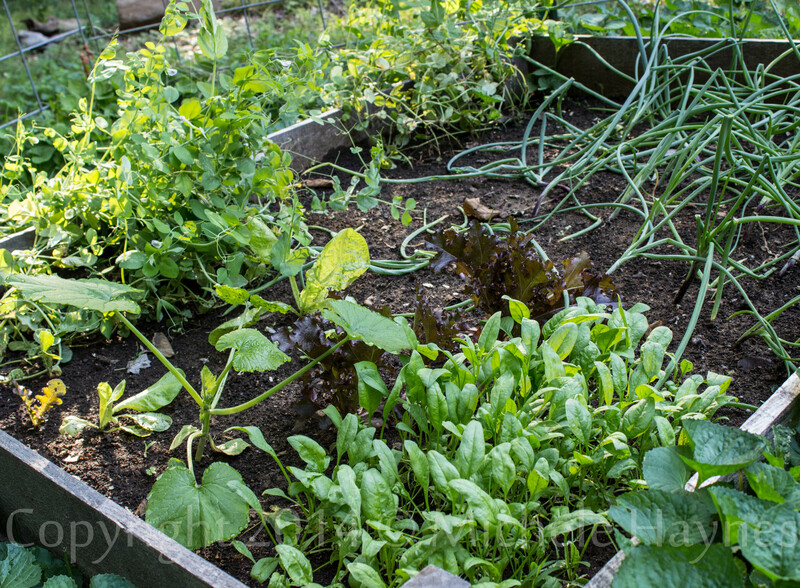 I recommend that every vegetable garden give it a try with at least one variety this year or next. Plant a little extra of an open-pollinated variety to save for yourself, to share, and to preserve biodiversity. I found a beautiful surprise in my backyard garden. This is my first video project where I recorded a separate audio track and added text. Yesterday, I posted on the Lemon squash that I grew this year. Now it is time to visit the rest of the garden, all of which survived while I was out of town, but some damage did occur from a storm and deer visits. 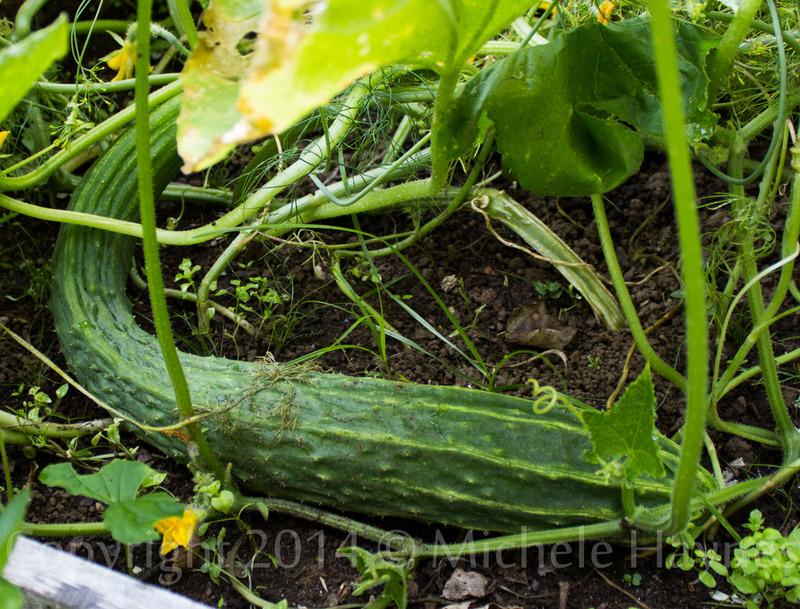 Pickling cucumber almost ready for harvest. Now I need the other vines to grow more so I can pickle them. 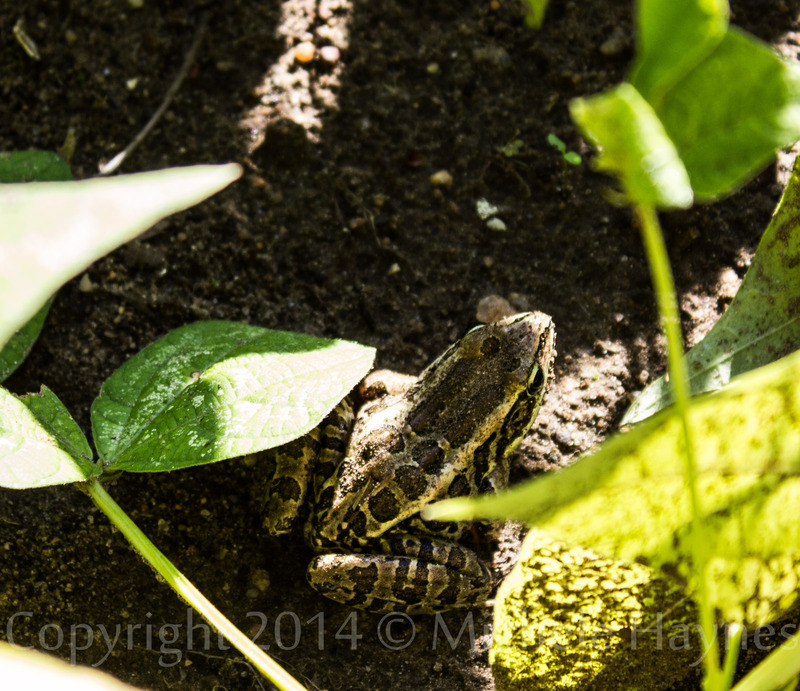 I love my frog and toad friends who live in my garden. Great for natural pest control. A storm came through Connecticut while I was in Texas and damaged most of my corn plants. Strangely enough, most of them are still alive and growing, just horizontally. I have ears of corn forming! Corn plants bent and broken, still growing but on top of my Moskovich tomato plants. My sons hadn’t harvested a single Suyo Long cucumber while I was gone. 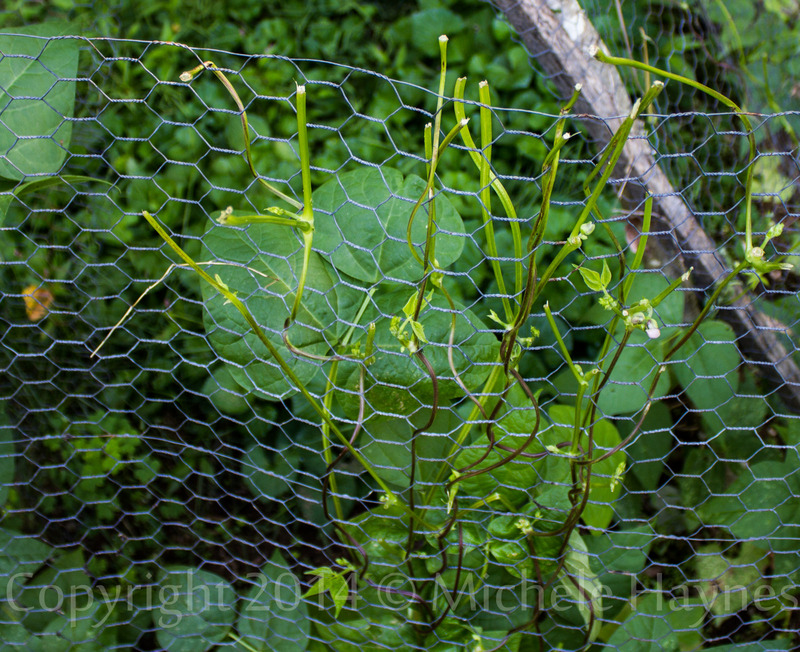 This monster will remain on the vine to mature for seed saving since it is too large to eat. There were plenty ready for harvest in a variety of sizes. There were still several outside — my hands were full. I have been eating cucumber all day long. Yummy! Cherokee Trail of Tears black beans have been feasted on by deer. The only parts of the plants that have survived are at the top of the bean teepee. I will just save what grows as seed for next year. Pear harvest will be small. Fruit is small and numbers are few. I have decided to made pear vinegar with most of the fruit. 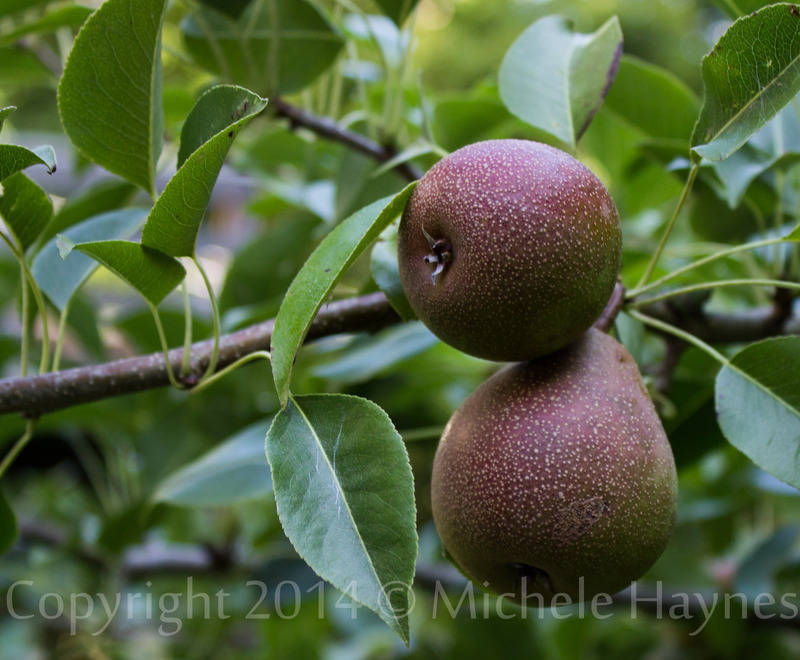 I am still enjoying last year’s pear vinegar and would like some to share at Christmas. Backyard garden showing spinach, red onions, and my huge zucchini plants. My sons didn’t harvest any of the snow peas, either, so they are done. 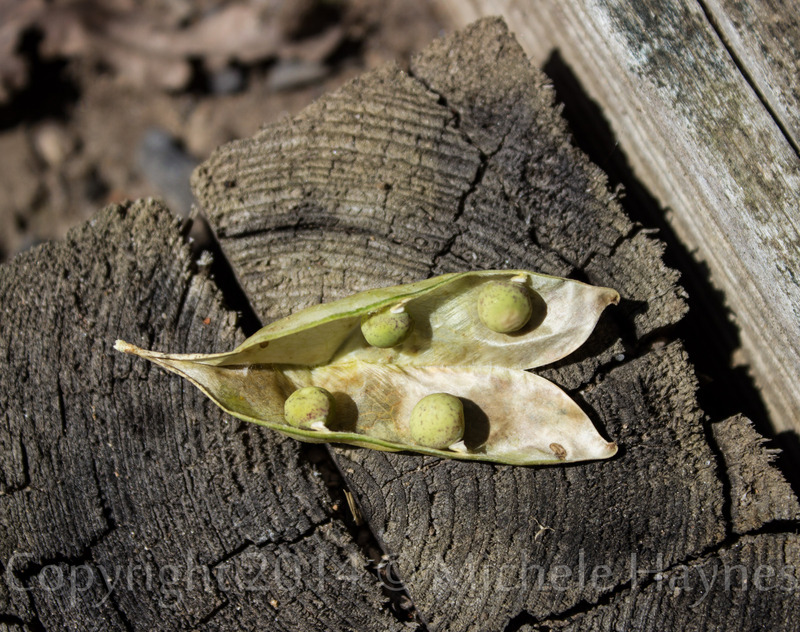 I am allowing the remaining pods to mature for seed saving. I thought about sowing seeds for a fall harvest, but I’m thinking it is too late. Just a feeling. The spinach has also bolted; I have hopes of saving heirloom spinach seeds. Remember: You can view all of the photos full-size by clicking on them and then return to the blog post using your back button. It has been quite dry here in Connecticut with little rain over the summer so far. My organic garden has been doing okay with limited watering, but not producing abundantly. I decided this summer to limit watering and then collect the seeds from the plants that do well. I water deeply and less frequently. 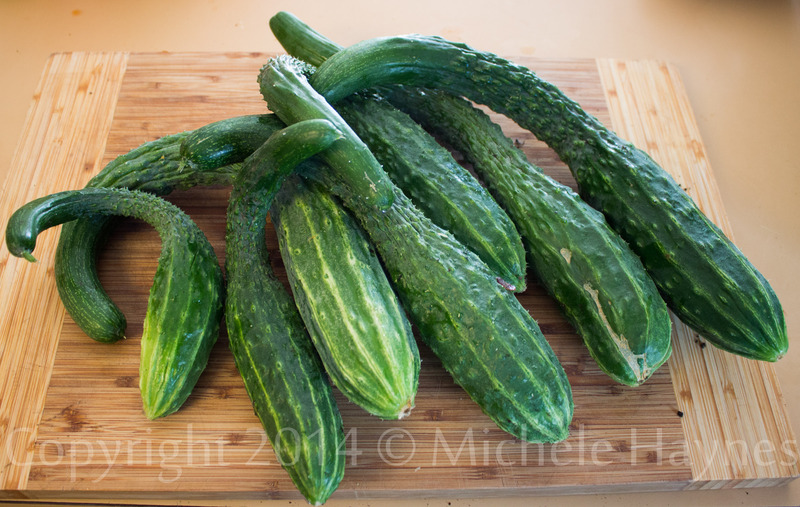 I have been harvesting a lot of Suyo Long cucumbers, one or two a day. I still do not have a single tomato growing but I do finally have flowers. 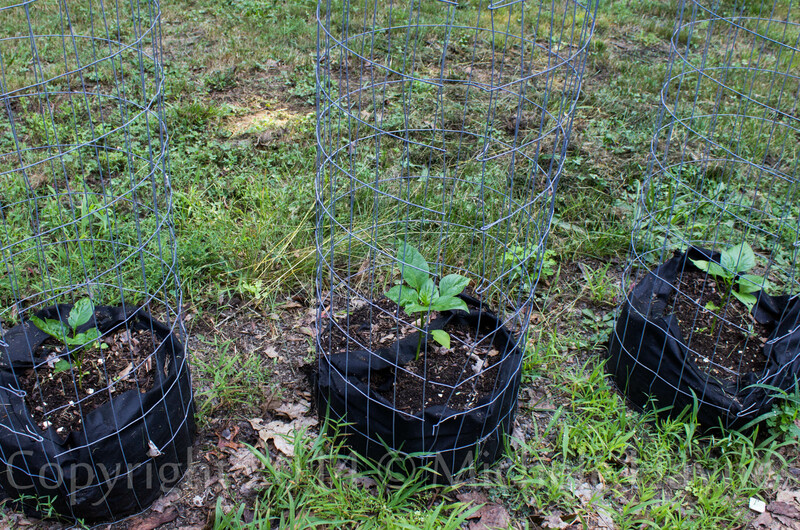 Is there time for any tomatoes to reach maturity before cold weather settles in? It will be a race between my tomato plants and nature. I remain optimistic as I contemplate the construction of a hoop house or two for the fall. I have tweeted about my 21-month-old granddaughter spending time with me in the garden. Our favorite thing to do besides jump off the front steps over and over and over again is searching for overgrown snow peas so that I can open the pods up and she can pick out the peas inside, eating them raw. If it is green, this little girl loves it! I am determined that my grandchildren know where their food comes from. She has helped me pick cucumbers off the vine and then within 10 minutes been nibbling on warm, juicy slices. She has seen my towering corn plants — she loves corn — and, hopefully, will remember those big guys the next time she eats corn. The lemon squash has started producing. 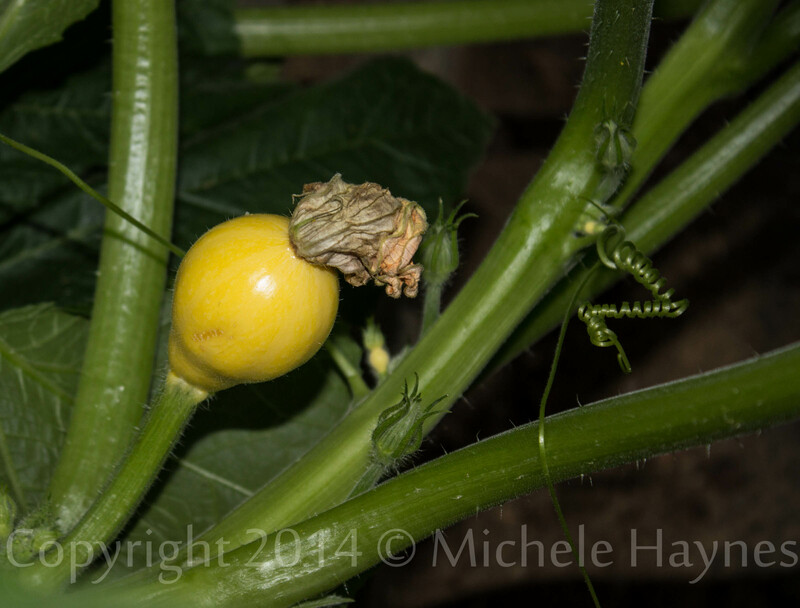 I have two pollinated squashes, one almost ready for harvest. I can’t wait to taste this heirloom variety. 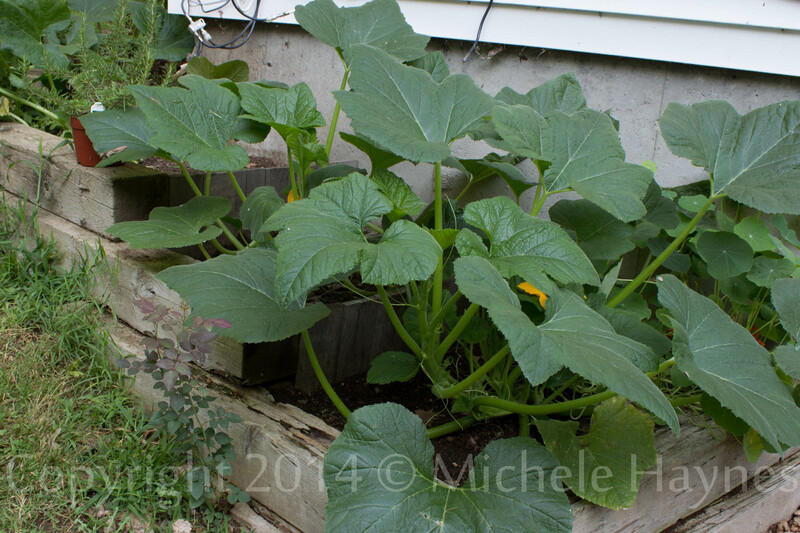 The zucchini are crowded now, as I expected they would be. Another race, I am hoping I get a harvest to eat sauteed with basil, made into zucchini bread, and for a few jars of zucchini relish. And finally, tiny pickling cucumbers are getting ready to flower and, after pollination, start giving us lots of cucumbers for making pickles. I am forever an optimist! I was out of town for a week, left instructions with my 21-year-old son to water and harvest beans, squash and cucumbers while I was gone and came back to a mostly intact, barely harvested garden. No complaints at all. Lemon squash plants doing well, a teensy bit of powdery mildew beginning and they are certainly producing now. I came home to seven lemon squash (my son showed me one he had put in the fridge after photographing the six), one quite oversized and the rest perfect for eating. The oversized fruit was certainly not inedible, just had some seeds forming. After cooking, they were as tender as the rest. My only complaint is the lack of sunshiny yellow squash flavor. When reading reviews for this particular variety on Baker Creek Seeds (I got mine at their Connecticut store: Comstock Ferre & Co.), one common complaint was a lack of flavor. I agree with this assessment. 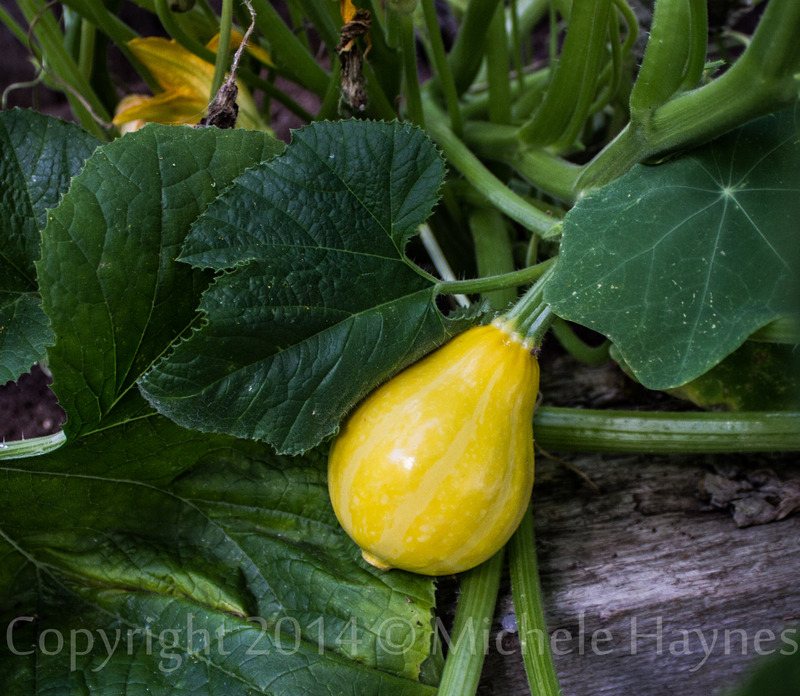 I most likely will not grow this squash again. 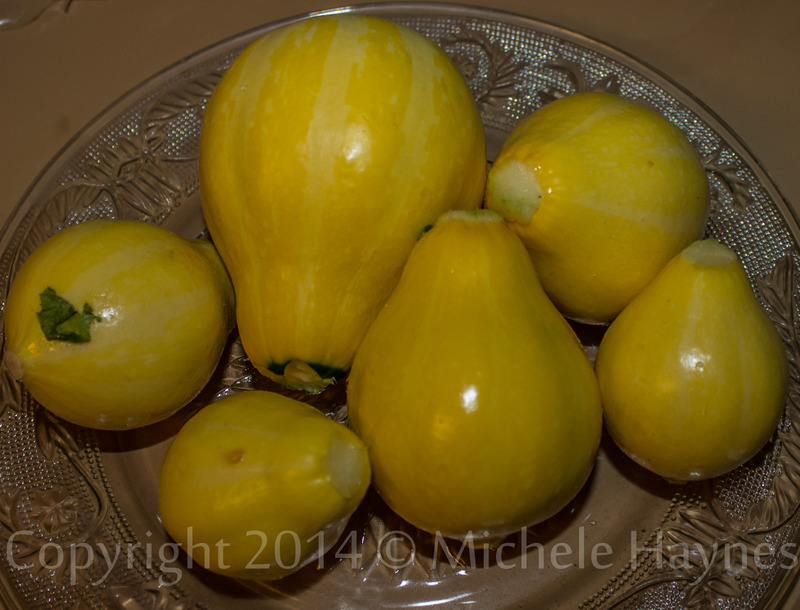 I really miss the deliciousness of heirloom crookneck or straightneck yellow squash. Lemon squash grown in 1 week. You can see the subtle stripes when I reduced exposure. 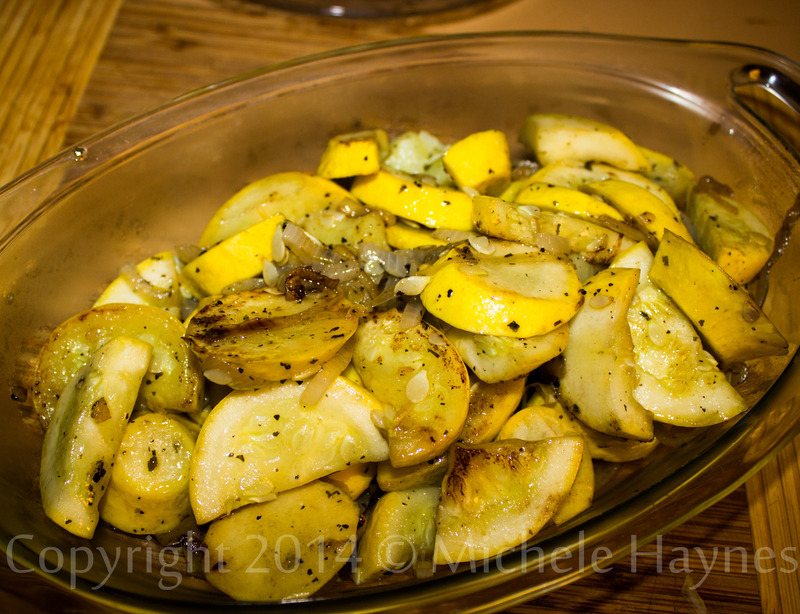 Lemon squash and onions sauteed in butter, seasoned with basil and salt. 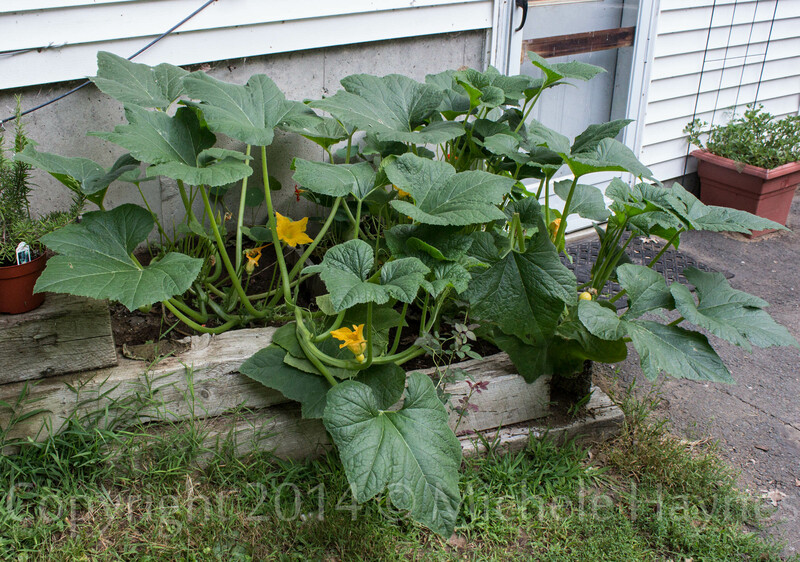 Prolific and easy to grow, Lemon squash did great in my late New England garden. Just doesn’t have enough flavor for my taste. Lemon squash. I recommend harvesting when the size of small or medium-sized lemons. Click on each photo to see a larger version and click again to zoom in to see close-up. 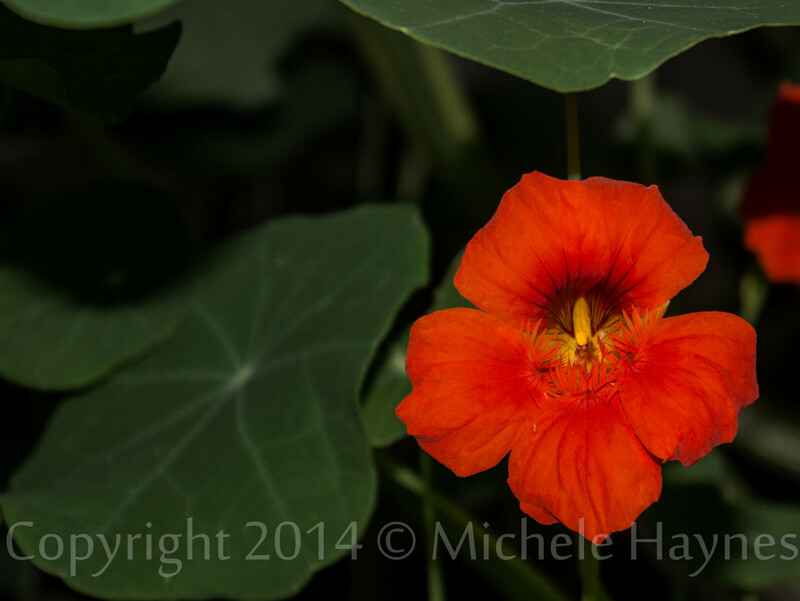 The nasturtium has details that I had never noticed with the naked eye. And remember, please do not take these photos or share them without express permission from me. Thank you. 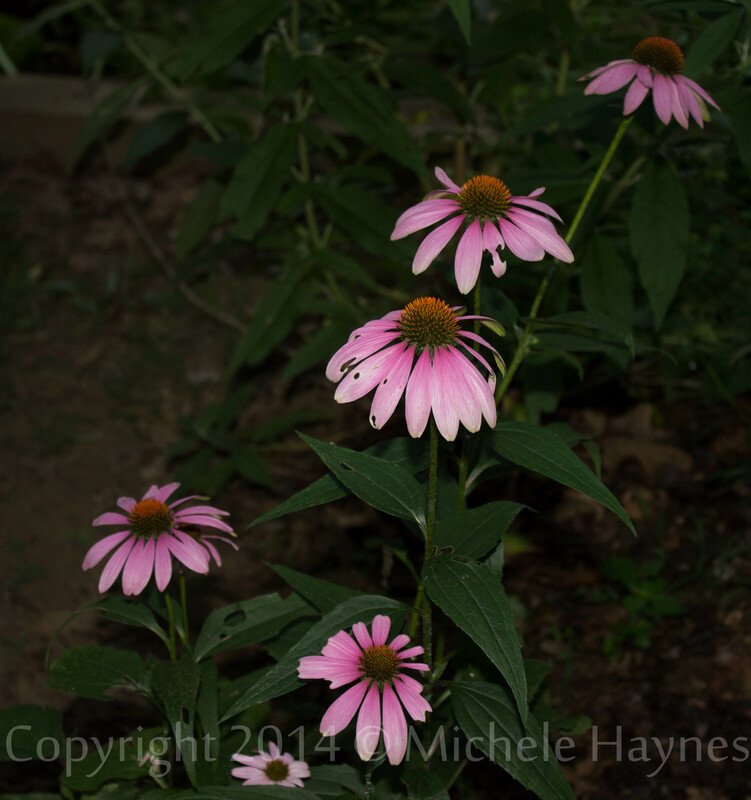 Purple coneflower waiting for the sun to come up. This is a cultivar that I purchased three years ago at a warehouse club before I knew that nursery plants are often sprayed with neonicotinoid pesticides which kill pollinators. 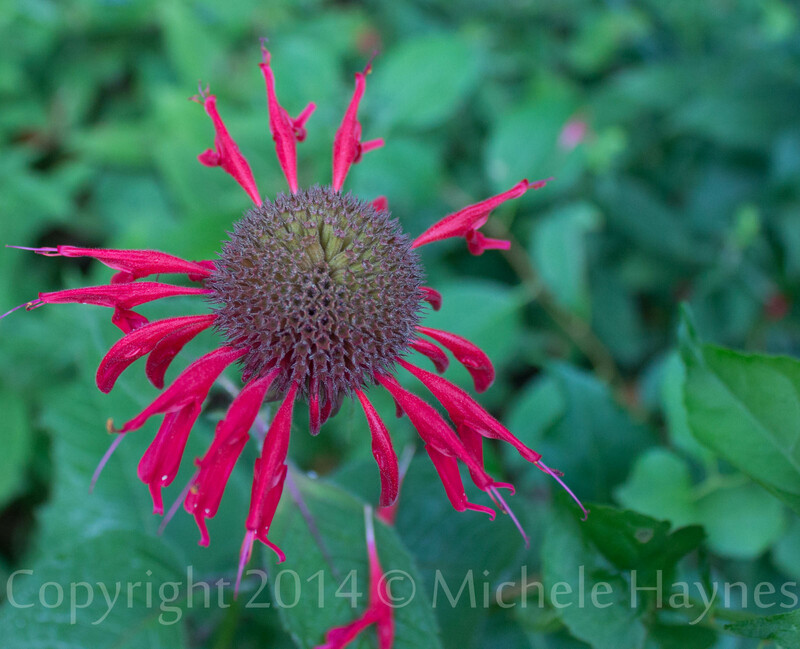 Bee balm seeds forming, last petals falling off. This reseeds every year. Giant nasturtium is an edible plant: you can eat both flowers and leaves. So fragrant, too! When I cut up one of my organically homegrown heirloom Suyo Long cucumbers and walked around offering slices to my sons (two adult and one minor), there were moans of pleasure, comments of deliciousness, and respect in their eyes. One of my sons commented that it tastes better because it was grown at home, referring to the satisfaction and value that adds. My other two sons just grabbed as many slices as they could, while one of my sons asked if there were more cucumbers. I replied that there was one in the fridge and many growing in the garden. I was thinking about how I wish my garden produced a lot more for my family. It seems like an awful lot of work for a few meals worth of fresh veggies. I considered my effort and the cost of seeds. And then I started thinking about the intangible benefits of gardening, like those moans of pleasure and the love my sons felt when I served them that cucumber. I consider the health benefits of vegetables grown in soil that hasn’t seen or experienced a single pesticide or herbicide in over 14 years, soil that is alive. I thought about the benefits of having my hands in that soil, transferring beneficial bacteria or probiotics that are beneficial to my digestive system. And then there is the fresh air, sunshine and gentle exercise I get when I pull weeds, haul the heavy hose around the different garden spaces to water, and the joy that I feel when I see insects everywhere feasting on flowers and sipping water from corn stalks. My sons have been taught the true value of food because they know where it comes from. They know the difference between industrially-farmed produce which has little flavor and less nutrition than its organically-grown counterpart which is grown in fields that are fed with organic matter, managed by human hands, few pesticides (only those approved by the USDA for organic farming). They can taste chemicals in packaged foods now. Yes, they can taste them. I have ruined my sons for GMO and preservative-laden foods. They know how to read labels and at the least value a cucumber because they know it takes months to harvest after someone works the soil, sows seeds, plants transplants, guards, protects, feeds, and nourishes the plants that produce that cucumber. They don’t balk at the higher prices of organic foods because they know that they aren’t subsidized by taxpayer money like GMOs. My organic garden produce is a gift to my family, one I give with much love. Background: I struggle with chronic fatigue and pain, and this year when it was time to start seeds indoors and then transplant out to the garden in the spring, I was struggling. 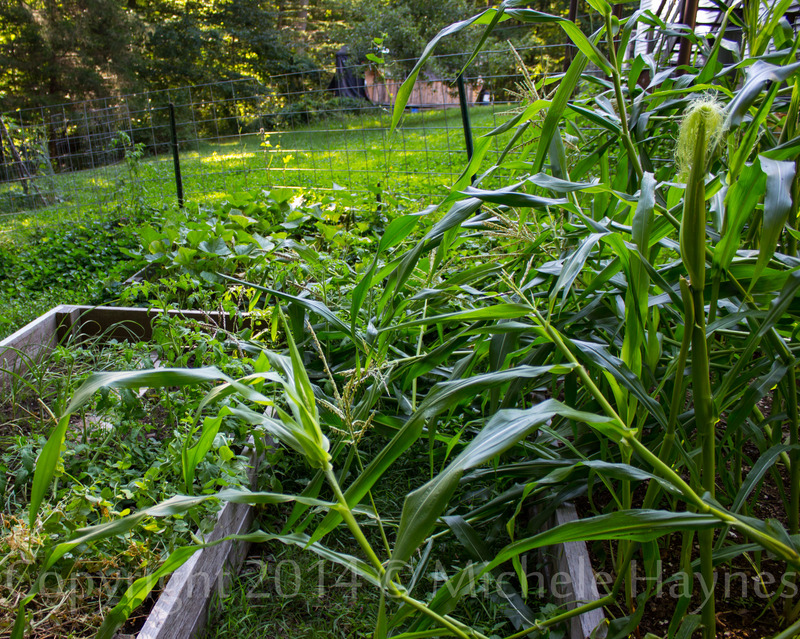 My garden wasn’t started until May 31, 2014, and a good portion of it wasn’t sown until mid-June. I did not start any seeds indoors but directly sowed everything in the garden. Below is the result of this late garden, an experiment in breaking northern gardening rules. This garden is what I could handle, and it is what it is. I am not disappointed except in the peppers and tomatoes, which are so late that I might not enjoy a harvest at all this year. 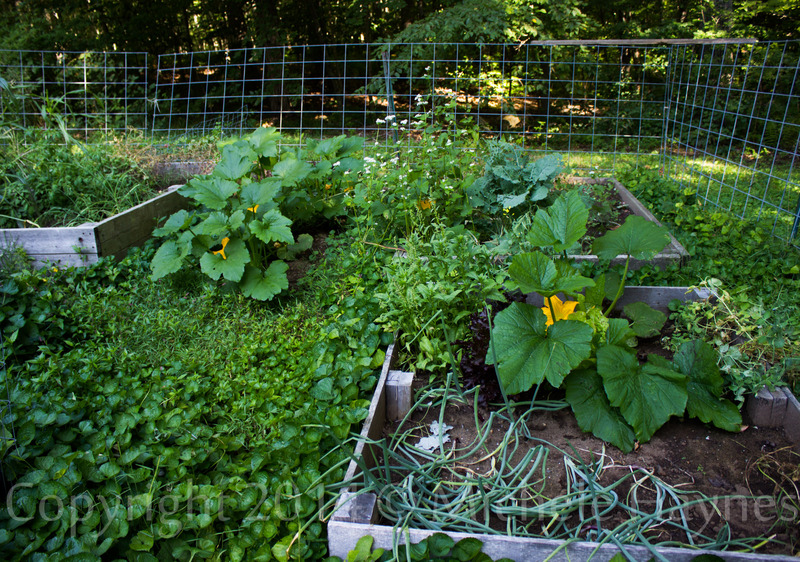 My garden is planted with heirloom vegetable varieties (open pollinated) and grown organically in south central Connecticut. I haven’t used pesticides in my yard since we purchased the property in 2000. This week: We have enjoyed a few days of rain, much of it heavy. I was a bit worried about how my garden would hold up to the pounding rain at one point. Looks like the wind did a little damage in the heirloom corn patch. Discovered a broken corn stalk this morning. No animals tracks, so assuming wind did this damage. The rest of the garden seems to have benefited from the warm summer rains. Lots of delicious snow peas. 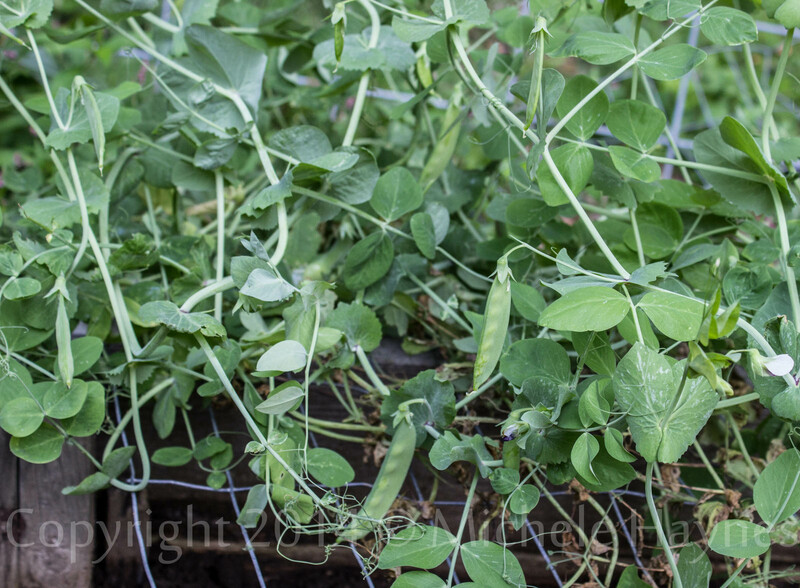 I sowed three areas with snow peas this year. Harvested first Suyo Long cucumber of the season. It is about 16″ long. 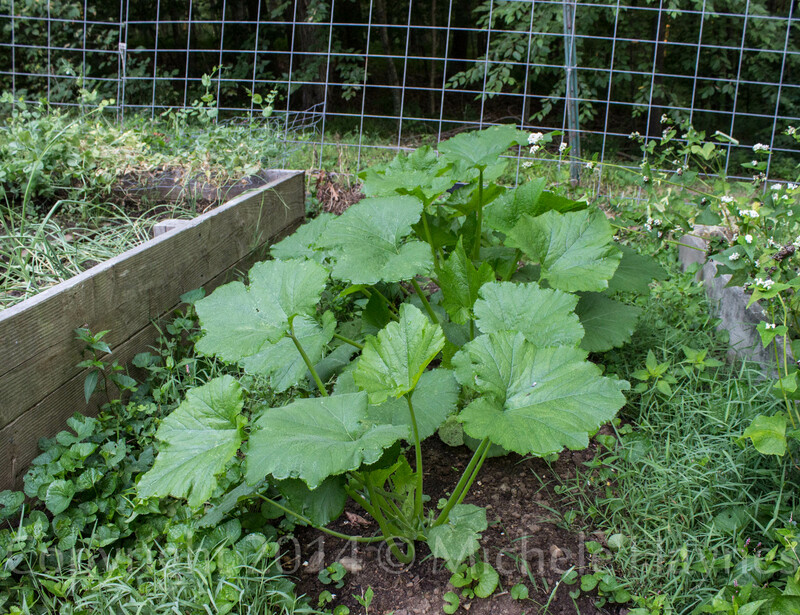 Zucchini plants have tripled in size in one week. Spinach, red leaf lettuce, Romaine lettuce, a zucchini transplant, red onions and snow peas in the back. 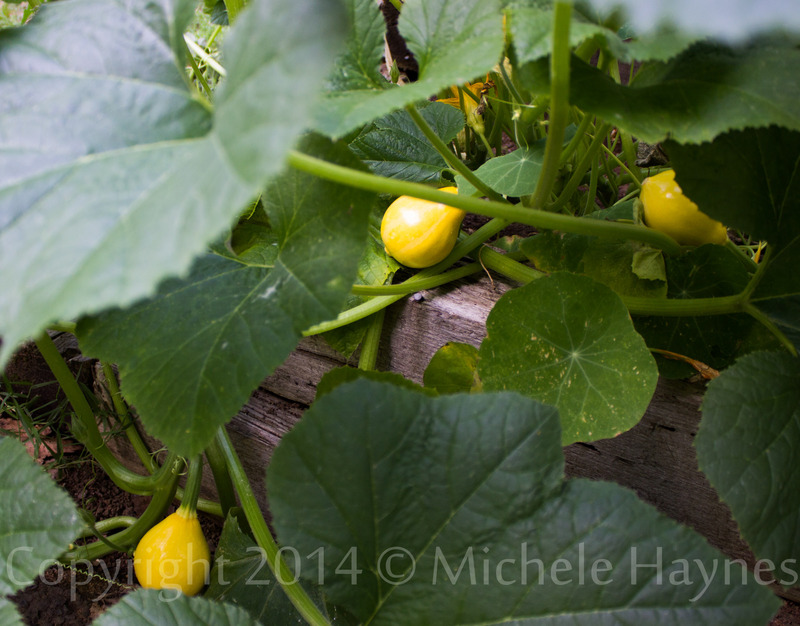 Lemon squash plants blooming in terraced garden. 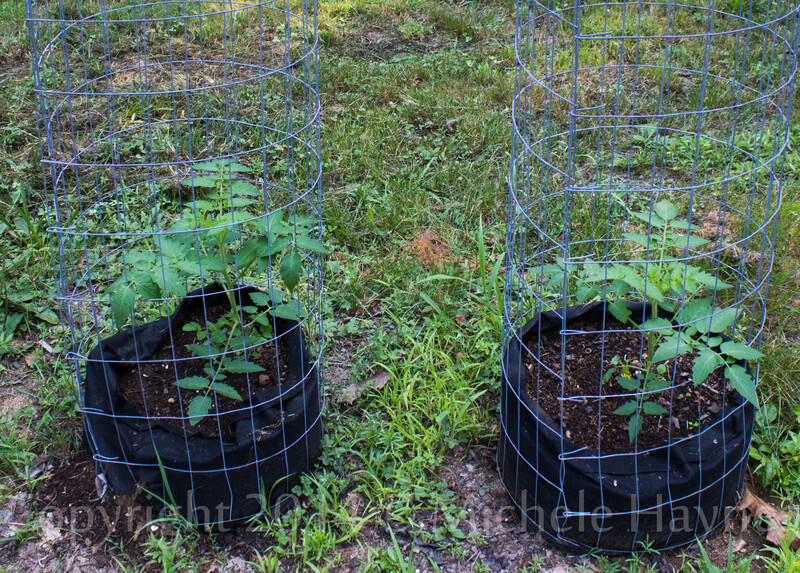 Tomatoes in grow bags beside driveway are finally taking off. Now to see if they have time to actually produce any tomatoes before cold weather arrives. Continuing the video tour of my Connecticut organic garden where I grow only open-pollinated varieties of vegetables organically. I use raised beds and intensive gardening techniques, no pesticides, make my own compost, and all while struggling with chronic fatigue and pain. My gardens aren’t pretty, but they grow food. 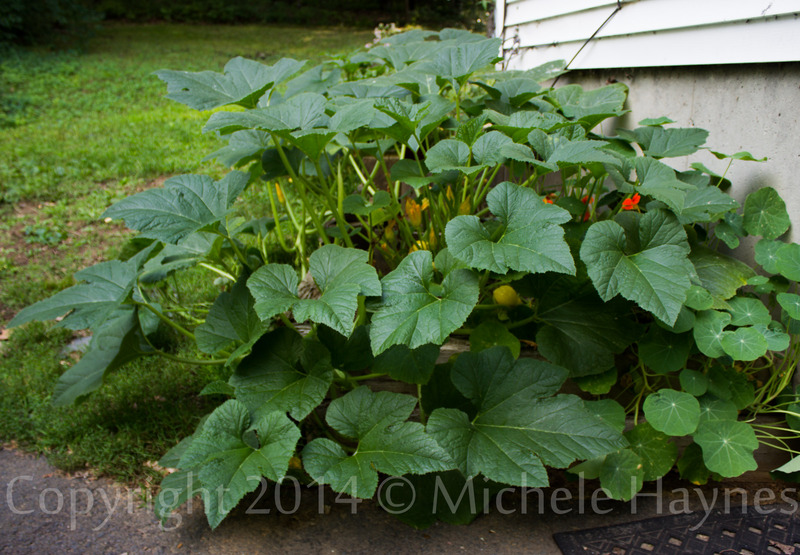 This year’s garden went in very late, and will most likely result in a fall harvest for most of what was planted. Fencing put up to keep deer out of garden is made up of cattle and calf panels supported by a single t-post. These are flexible, affordable, and are easily removed at the end of the season. I hope you enjoyed walking around my garden with me. Please come back any time!